Sometimes silence is the best response. The Deepwater Horizon oil spill in the Gulf of Mexico happened in 2010. In an age of swift news cycles, it’s a rare story that lasts for not just weeks or months, but years. This one, rightfully so, has. In part, this is the doing of BP. Last week, an opinion piece ran in Politico magazine in which the oil company questioned just how much the Gulf was damaged by the spill. This question sends the message that BP still isn’t taking responsibility for what it did. “Immediately following the accident in 2010, many predicted it would have severe and long-lasting consequences—for the Gulf of Mexico and far beyond,” the article reads. 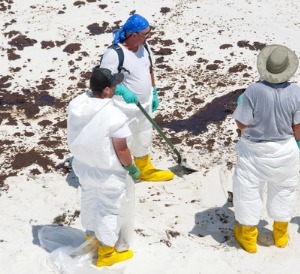 It continues to list a number of things — tar balls washing up, for instance — that it says hasn’t happened while conceding that, yes, the incident was a “tragedy.” But there were a number of factors, including the swift response and the resiliency of the Gulf, that made the situation less severe than predicted, the article says. “Unfortunately, these facts and others about the Gulf’s recovery tend to go overlooked. Many advocacy groups cherry-pick evidence and promote studies that paint an incomplete and inaccurate picture. And they blame BP for any and all environmental problems afflicting the Gulf,” it says. Now we have new research that says there’s an oily “bathtub ring” the size of Rhode Island on the sea floor. BP has an answer to that too. “Instead of using rigorous chemical fingerprinting to identify the oil, the authors used a single compound that is also found in every natural oil seep in the Gulf of Mexico, causing them to find false positives all over the sea floor,” they told NBC News. “Scientists are still trying to figure where all the oil went and what effects it had,” the article continues. Sigh. BP wants to defend itself, but the defense is overzealous given the facts. Sometimes the best response is to fall back and take a hit while demonstrating positive results. Definitive recovery will go a long way to shutting down criticism. In the meantime, millions of gallons of oil exploded and seeped into a body of water. That’s going to have an impact. Trying to react as though it’s a drop in the bucket (literally) doesn’t make sense. Separately, Mediaite says the article wasn’t appropriately tagged on the site at first to reflect that it was an opinion piece from BP’s communications executive. That is just more bad.